As specialists in pain relief and injury rehab, we’ve treated many patients injured in car accidents. Here are the most common questions we’re asked. If possible, pull off to a safe place. Check your surroundings for potential hazards. If you see gas, fire, etc., get out of harm’s way! Make sure you and everyone else in the car are OK. Call 911 and let them know what happened EVEN if you don’t think that you’re seriously injured or that your car is damaged. Don’t sit, lie or stand between vehicles or in the street. Move to the sidewalk or median. Other drivers may not see the accident and may strike one of the vehicles or pedestrians, further injuring anyone present. Keep your cool and don’t engage with the other driver unless you feel that the conversation will be peaceful. In general, in New Jersey a police report is required if anyone was injured or killed, or property damage worth more than $500 occurred. Call your insurance company and explain what happened while you still remember it. Use calm, objective and factual language when possible so they can gather as much useful data as possible. Then, call us at (973) 366-6615 and let us know you’ve been in an accident. We’ll schedule your initial evaluation ASAP. You can always speak by phone with one of our injury and pain doctors for free, before making an appointment, to make sure we’re the right place for you. If you believe you may have been injured, let emergency responders know. Don’t try to make a determination of the seriousness of the injury — that’s their job, and ours. See an injury and pain specialist as soon as possible. You might feel fine initially, then starting experiencing pain days, weeks or even months after the accident. Not seeing someone right away can hinder your chances of a speedy and successful recovery later. If I’ve been injured, when do I need an attorney? Right away. It’s important to know your rights even if you don’t plan on suing the other driver. Auto insurance is different than regular insurance.You need to know how to use your auto insurance properly in case you need care. In New Jersey, your auto insurance generally pays to treat your injuries and cover your lost income, regardless of who caused the accident. If you have certain very serious or permanent injuries, you may be able to collect additional compensation. How long should I wait to see how badly I’m hurt? It makes sense to get an initial medical evaluation right away. There’s no downside, and waiting too long may make your injury or pain worse. If you have any pain or any concern, see an injury and pain doctor ASAP. Plus, not everyone needs treatment after a car accident. It’s possible that you’ll be perfectly fine, with no issues. Get yourself checked out with an initial evaluation, so you know for sure. Absolutely don’t wait longer than a week, especially if you are experiencing headaches; parathesias like burning, tingling or prickling in your face, legs or arms; numbness or weakness; or similar symptoms. The safest course of action is to seek evaluation from a doctor who specializes in treating auto accident injuries. Car accidents often involve traumatic injuries caused by high-impact collisions, sudden acceleration and deceleration and other forces that cause specialized types of injuries. 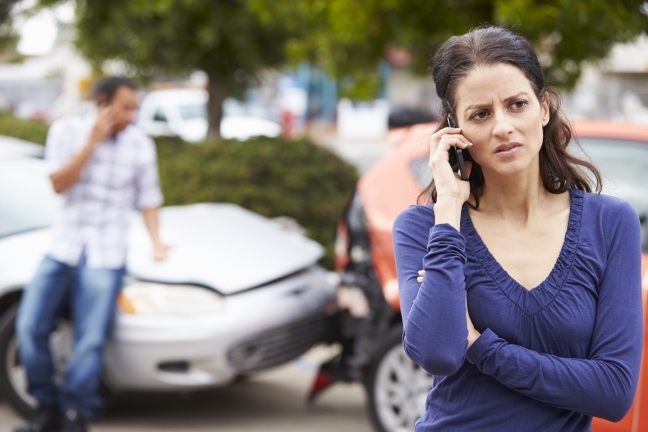 Auto accident injury specialists know what to look for. Sometimes the answer won’t be obvious to a layman, and they can identify and evaluate silent signs and symptoms that may be a problem later. Better safe than sorry! However, many injuries are symptom-free for quite a while, and then gradually or suddenly start causing pain for no immediately obvious reason. Who do I talk to first: my attorney or the chiropractor? Your health is always the first priority. A healthcare provider who specializes in these types of auto accident injuries is the person you should see first. It’s also good to see a doctor right away so that your symptoms or lack thereof can be documented in a timely manner. Nothing prevents you from seeking legal advice at the same time. If you need an attorney referral, most doctors who specialize in treating car accident injuries will be happy to share the names of the attorneys that their patients commonly use. FYI, doctors are not allowed to accept referral fees from attorneys. Although most everyone worries about how they ‘re going to pay for care, you shouldn’t. Any doctor’s office who deals with auto cases should be able to discuss financial responsibility without any issues. There should be no surprises. If they can’t, you’re in the wrong office. Do you help my lawyers build my case? It’s up to you and your attorney to decide whether to pursue legal action and build your case. It is our legal and ethical responsibility to help our patients get the proper injury work-up, assessment and care. It is our responsibility to objectively document your evaluation, condition and treatment. Do I pay up front for my treatment? New Jersey is a no-fault state. This means that your auto insurance will pay for your treatment, no matter who caused the accident. Our first priority is to get you feeling better. Treatment can usually begin before your insurance claim has been resolved. Your treatment is based on medical necessity. If you need care, you can continue to receive care related to your claim for up to two years after the date a bill is last paid. You won’t be surprised by unexpected medical bills. Before your first appointment, and again after your first evaluation, we will explain the type of policy coverage you have. If a deductible or co-insurance is involved, secondary insurance (if available) or a potential settlement award may cover even those expenses. In most cases, there should be no cost to you whatsoever for treatment. Can you coordinate care with my doctor or surgeon? Yes. First and foremost, we care about your health and only accept patients that we can help. If you require surgery or other specialties not provided by PRWC, we will of course immediately inform you. We’ll make referrals as needed, and coordinate your care with your surgeon, family doctor, or other specialists. Because we integrate multiple specialties under one roof, the care we provided is thoroughly coordinated. That makes it easier to pre-inform you of your coverage, financial responsibility, and what to expect from each provider you see. Which is the point of an integrated center! How can I tell what services may be covered on my claim? PRWC has a staff that specializes in accident injury claims. Before we recommend or provide treatment, we will let you know what’s covered by your plan and what’s not. The following treatment services are often covered: physical therapy, chiropractic care, acupuncture, pain management, surgery, and diagnostics. What types of treatments are typically recommended by your office and why? Every PRWC patient receives individualized treatment based on an initial comprehensive medical history and assessment. Although we provide physical therapy, chiropractic care, pain management, acupuncture and medical massage, we also refer patients to other specialists if they need treatment we don’t provide. What if related pain or injury is discovered well after the claim’s settled? Claims are generally considered open for two years after the last date of payment of a bill. So, you have time, but if you wait too long, your insurance carrier may deny payment stating that there is no causal relation. That’s why it’s so important to do it right from the start, including getting a police report, visiting the emergency room if necessary, and getting an initial evaluation by an accident-injury doctor within one week. You may not require long term care — or any care at all — but you can’t know that right away. Protect yourself by promptly documenting what occurred, both in terms of the accident and your medical condition immediately after the accident.